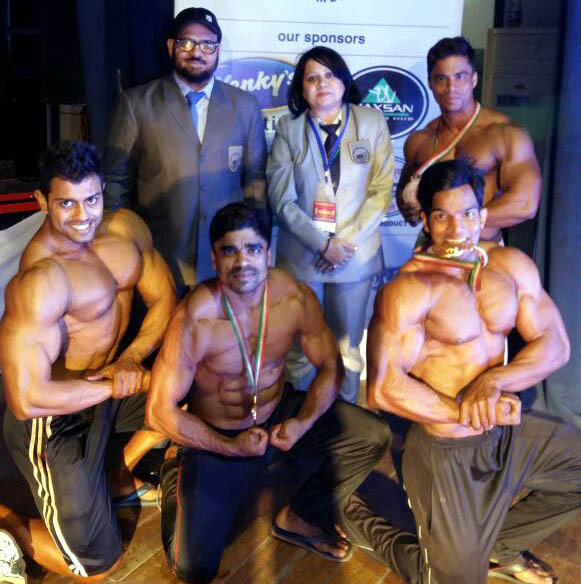 Odisha competitors bagged one gold and two bronze medals in 7th Federation Cup Senior National Men’s Body Building and Sports Physique Championship, held at Bhartiya Nritya Mandir, Patna, Bihar on February 27 and 28, 2018. This was announced by Odisha Body Building Association today. Rashmi Ranjan Sahoo (Bhubaneswar) captured the gold in 75kg category, while Brajabandhu Suara (Berhampur) and Balal Khan (Chhatrapur) pocketed one bronze each in 65kg and 70kg categories respectively. Among other Odisha competitors, Rakesh Sahoo secured fifth position in 55kg weight group. Odisha Body Building Association president Chitta Ranjan Swain and secretary Prasanna Mahasuar congratulated the medal winners of the state and wished them more laurels in the future. PHOTO: Odisha medalists with Indian Body Builders Federation president Prem Chand Degra and National judge Sumitra Tripathy in Patna.